Let me tell you the story of a particular man. His delicate, organic and insanely detailed environments have inspired hundreds of happy gadders to emulate his work. The sheer spectacle of one of his creations is enough to send his followers into crazed fits of jealousy, bemoaning their own mediocre talents to anyone who would care to listen. The moment he hits the publish button, a shiver goes down the neck of all who know him. His name travels far and wide, and that name is..? Oh mercy! 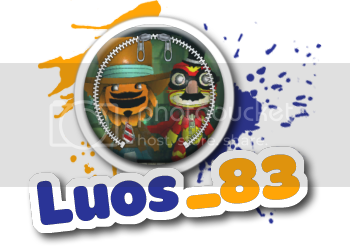 I meant Luos_83, of course! So I'm not going to beat around the beautifully crafted bush any longer, let's hear from the man himself! All right, this one isn’t really a question, but if you would be so kind, please list the levels you’ve published to date and any statistics you’d like to share with us, i.e. plays, hearts, how many rocket animals per level, etc. Whatever you feel like sharing. I think that might be all of them, I made so many levels I might have forgotten one or two. Now, tell me... of these levels, which is your favorite? And why? I think it might be "Logic Island" because me and c_mckamey had lots of fun creating the logic and the world around it. I was kind of amazed how well Clay made the logic statues and that nobody ever did that before. But I also really loved working on Lockpicks Maze because it was such a grandeur project that even haunted me in my sleep. In the end I tend to value a level on how much fun I had while creating it, and I prefer to co-create because in my experience it adds so much fun to the whole process. How long have you been playing LBP? I got my hands on LBP a month after the release date, but took a year off when update 1.07 hit the servers and deleted all my hard work. If it wasnt for Ladylynn I would never have touched lbp again. What was the first full level you ever built? And what was it like? Well, that would be a level for another game actually, my first level was way back when I just got Unreal Tournament which was a lame forest with a temple on each side with the very creative name "CTF-Foresttemples". But when looking back it was a piece of junk nonetheless. What creators and levels (if any) have inspired you to create? I think it was Gek83. His "Temple of Elements" level is what inspired me and showed me what was possible at the time. X-Nobody-X also showed me some tools of the trade, and that helped me a lot. 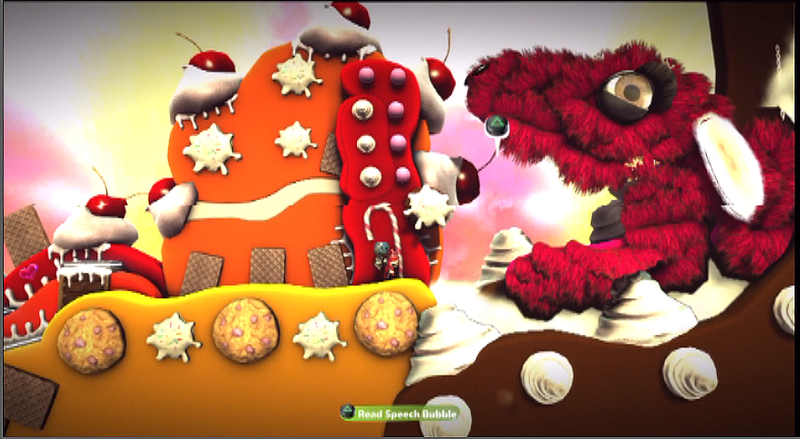 But I actually got LBP to create in the first place, so the drive was there from day one. Aside from drawing inspiration from other creators and levels, is there anything in the world outside of LittleBigPlanet that inspires you? This could be a hobby, profession, or even a particular movie or type of music. Pretty much it can be anything in your personal life that has contributed to your experiences as well as inspired you as a creator. As a kid it started with Lego, making my own things and coming up with stories like "Robot town": A city made entirely out of robots defending it from intruders, like the plastic dinosaurs we had... For some reason plastic dinosaurs loved the taste of yellow Lego people. At the age of five I got my first console.. a "Pongstation". It was a simple console with one game... "Pong". A few months later the NES arrived at the scene and I have been a game-addict ever since. Games, all games (and I have played thousands and thousands of games in my life) inspired me one way or the other. I could go all sentimental and talk for hours about which games inspired me.. but I dont want to waste everyone their time with it. Photography also helped me a lot while creating because it learns you to look at the world in a different light.. It makes you understand how light, color and composition works. To sum it all up.. anything can be inspirational and influence you in the way you create and in the way you grow as a human. What are some of your favorite video games (excluding LBP) - new and old? I think I mentioned in the previous answer that I wouldnt go into this... You are evil Ria, very evil! If you could list your favorite things about LittleBigPlanet, what would they be? The community in all its flaws and its greatness. And your least favorite thing(s)? The way cool pages work. Losing lots of work due to bugs. Updates that break more than they fix. Don't get me wrong about the community; In retrospect I can laugh about all the cool page spam and the way the community flocks to it like it's the next big thing. For some reason "bieberbombtrainhotelsharknuke survivals with real water, prizes and free costumes" will keep attracting the young generation. We can be angry about it or laugh about it and see the lols in it. The community is diverse, and occasionally very strange, and if we are part of it I guess we just have to accept the whole comunity in its flaws, greatness and with that even the "trolls". I do think we should all be a little nicer have more respect towards eachother. “If you prick us, do we not lose stuffing? If you tickle us, do we not laugh by pressing up on the dirpad? If you poison us with gas, do we not die and respawn to the closest checkpoint? And if you wrong us, shall we not revenge by slapping you into a pit? What’s the worst thing that’s happened while creating? Losing a lot of work, and having people break your stuff when they join. On a sort of similar subject, have there ever been any great ideas you had that failed or for any other reason you never implemented? Oh I got plenty, some waiting for inspiration, others scrapped because LBP2 opened up many more possibilities. Me and clay got at least 10-15 levels collecting dust due to lack of gameplay, inspiration or other reasons. If you there was anything you could change about the game, what would it be? This could be anything from adding materials or tools to eradicating H4H. A seperate page in the game that works together with LBPC, LBL and Planetarium would be great. Show new levels posted in threads on their websites, a unique page for i.e. level spotlights and creator spotlights would add a lot to this game. If it was on a creators point of view I got so many many ideas and suggestions for lbp2 or any future lbp game that I could go on for many many hours. Does Poochy want some Icecream? Yes you do! Good Poochy! Before your time as a happy gadder, you worked in the gaming industry as an environmental designer, I believe? How do you find that this previous experience, creating for games, helps you in your LBP creations? It is both a blessing and a curse in my humble opinion, let me explain why. The curse of it is that I tend to keep things really realistic, so no floating platforms or magically created devices. Something that actually would fit perfectly in LittleBigPlanet and I tend to stay in my comfort zone (caves) as they were my specialty back then. More than often than not Clay (c_mckamey) and Fotosynthesis will go "Please Luos, no caves this time" and they are right.. I should try to stay away from caves a little more. Another problem is the fact that I tend to go for visuals first and gameplay second which even though I do it myself is a big no-no! The Blessing is that I do not feel limited in anything I make (besides a few limitations LBP has, like a better way to tranfer data between levels or even a decent savegame logic for levels). You and c_mckamey (Clay) have become quite the team on LittleBigPlanet, with your co-creations consistently wow-ing the LBP community. How did you two meet? I bought Clay on ebay. Just kidding! Way back in LBP1 me and TheAdipose where co-creating a lot and since Adi was also part of the community spotlight team we often played levels together. One of those levels was one of the first levels Clay made. It was called "The temple of the Sky-Orb" and I saw a lot of potential in his level, especially when it came to logic which he showed off in secret rooms in his level. I contacted him and we instantly became friends. I would probably have given up on creating if it wasnt for Clay. Sadly (and I am guessing partially because of this) my contact with Adi slowly withered, and I am occasionally still sad about that because I miss him as a friend, co-creator and epic gameplay designer. That said, I am really happy I found someone to create with on such a regular basis and I am sure Adi knows I still care a great deal for him. Tell us a bit about how well you work together. What sort of roles do you take on? Do you both have set tasks that you stick to in create mode, or is your relationship more equal? I tend to do the visuals mostly and I am not the worst when it comes to logic but compared to Clay I am a complete n00b. 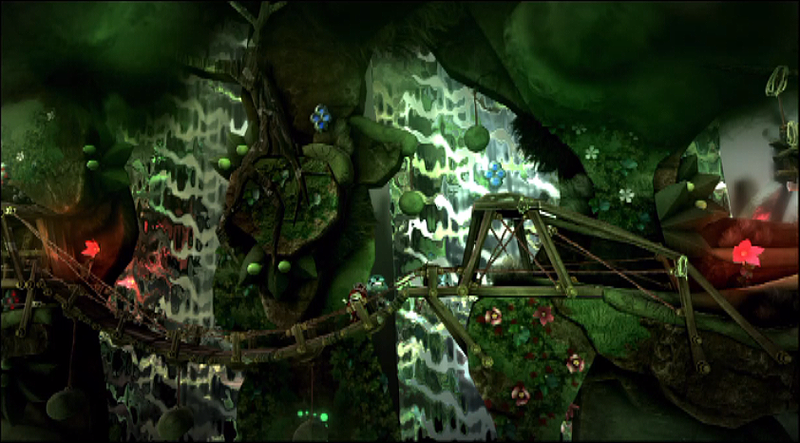 I of course focus mostly on the visuals and audio of the level trying to make things as beautiful as I can. Haha, Clay never uses a microphone.. well.. he did use his microphone once and he has this great southern accent. (Think: "Did you bring the truck witchadicha?") And anyway, if anybody likes to abuse the thermo it's him. Together we tend to fully ignore the thermo and find ways to cram it all into one level, even if it means we need to start removing any corner we can find, remove stickers here and there and place whole sections of the level in an emitter just to force it all into one slot. That said we do tend to discuss a lot of things and it occasionally does happen that one of us simply cannot agree with the other, and then we keep talking until we find the middle-road, or even drop the matter until a later time. This way we can keep on creating and in that process often come up with a better solution to our problems. “And then he smeared some glitched material given by Aya, and there was earth.” A while back, you mentioned in passing that the majority of your levels were made from glitched dark matter. Just how many tricks do you keep up your sleeve to keep the precious thermometer under your command? Ah yes, here are some things we tend to stick to. 1. Some basic things that really help is removing any corners on objects that are hidden behind decorations or are never in view at all. 3. Moving objects are heavier for the engine than static ones so keeping a gravity modifier on them untill the player can interact with them also helps a little. 4. We also tend to keep any moving objects (and sackbots) in emitters and only emit them when we need them to appear. 5. Destroy anything the player can't get back to; this lowers the thermo and in result allows you to emit more bigger pieces. 6. Instead of placing a square piece of holo, sticker panel (sp) or Light/dark matter try to use triangles, one corner less might not be much but if you use hundreds of holos to put decorations or logic on it will save you hundreds of corners. 7. The "de-collision tool" or "ghosting tool" allows the creator to permanently or temporarily "ghost" an object to remove its collision, this way of work takes a little more time but can save the creator hundreds of corners and objects as well as allowing the creator to actually have moving stuff in the background layers, even if the creator build something in the background. 8. Aya042 published a great level back in LBP1 in which you could collect glitched materials, think of metal thats as light as floaty or sponge that acts like dark/light matter. Sure a lot of logic material modifiers can do this for you as well but not having to use logic means a liiiitle bit of thermo can be saved to place something else as well. 9. Dont use too much different materials, decos and stickers. The more materials, the more thermo you will use, same goes for stickers and decorations so always look at your thermometer when placing something new and consider if its worth it. 10. Last but not least "Real Water". Ever since LBP2, water takes up thermo (about 2.5 bars) so if you do use water you could try to only activate it when a player is close and drain all the water when a player isn't near this liquid goodness. This in combination with emitting new level sections or objects can give you some additional breathing room, as well as giving back some fps (frames per second). You've already mentioned "Lockpick's Maze", a level of yours that literally made my eyes pop out of my skull! You talk about finding inspiration anywhere around you, in art, games and films to name just a few sources. Where on earth did you find inspiration for that particular concept? I was cleaning up one of my closets, and found a small minimaze. It's a circle-shaped maze the size of a childs hand and you have to maneouvre a little metal ball through the maze from point A to B. For some reason this inspired me to make lockpicks maze. Instead of a ball we used a cute little bot who got stuck in a nightmare and lost the ability to walk and the player needed to rotate the maze to make the little bot move around in his rotating nightmare. A bit farfetched but it worked out in the end. Gameplay aside, the lighting is probably my favourite aspect of the level. Do you find that your experience with photography helps you to visualise the concepts for your levels? Oh yes it does, not so much when it comes to gameplay but much more when it comes to the overall theme and camera angles in the level. As a photographer you learn a lot about compositions, (like the rule of thirds ) but my education also involved the history of art which taught me a lot about all kinds of compositions. This helps me to try and get great camera angles and design the surroundings in such a way that both the scenery and camera angles compliment eachother. After a few months playing around shooting photos I started to notice my eyes and mind reacted more to subtle changes in sunlight. For instance a cloud close to the sun can already remove a few percent of light which I never really noticed until my eyes started to look at lighting in a more professional and playful way. These subtle light changes are something I try to put in my level, often so subtle that the player doesn't notice it, but still gives them a certain feeling when they enter or exit a cave for instance. My macrophotography helps me to wonder and fantasize about strange new worlds that we normally don't see.. I tend to try and get that feeling into my levels one way or the other. Moving on from Beh'Ta to Reh'Tahl, I understand you're now working on redoing your side-scroller "FRANTIC". The images and previews you've been putting out look incredible so far. What challenges are you facing in completing this huge project? First of all is the logic, the complexity isn't the problem because I got Clay to help me out but it's a lot.. a loooot!! Having to make AI for 140-something enemies is a real timesucking process, then having to make 10 original levels all with unique scrolling backgrounds that often change scenery halfway the level is also very time consuming and often mindnumbing. Then there is the space-ship itself we worked on for five weeks hourwise. It contains 48 different projectiles and around 150 emitters which at the moment has this slight latency issue with the 4 secret weapons, resulting in the probability we (Clay) have to redo almost all of its logic. At this point, I hear Clay screaming "Noooo Rrrraagggeeee!!!!!!!11111!one!!!11eleven!!" in the background... Maybe someone could fetch him a puppy or something, to calm him down? The biggest problem though is a way to transfer all the information (purchased weapons, score, levels completed, a total of 32 bits of data if not more) to the next level. This is now deemed impossible, and we thought about different ways to make this work, but all ideas so far ended up making the overall experience of this game less interesting. In the meanwhile me and Clay do occasionally work on some stuff for this Epic revamp of Frantic but when we get bored we tend to work on other stuff thats easier to achieve. I've noticed that you like sharing prizes with the community in your levels, gifting players little snippets of logic and decoration which give insight into your creating methods. Do you feel that this is an important gesture towards the community, as a positive reinforcement of the 'Play, Create, Share' ethic? Personally, I don't care much for community prizes and my "collect community" is always turned off. But some people do like these prizes, and if I find something that's interesting or fun to share, I might still hide those prizes around my levels. Levels like Robbit10 - his creator toolkit is much more interesting than a regular prize in a level, and with all those "Free costumes!!!111!!" Levels out there giving prizes away, in regular levels it can feel like just an annoyance. So especially nowadays I tend to only give stuff people can really use. And now... on a more lighthearted note: Err Lu... if there's any sort of deep, personal affection for a certain creator that you want to get off your chest, this could be the perfect opportunity. What?! Who told you about my feelings for Felkroth?! 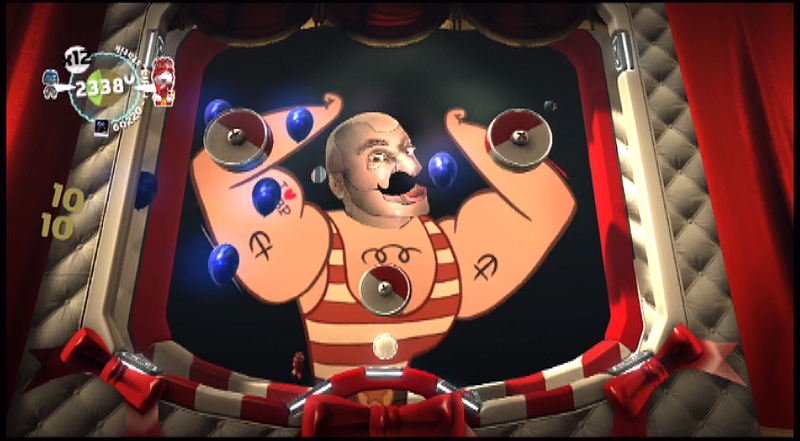 Ooh thats "Luos Big Guns", one of the characters in my newly published level "Cirque Absurde". Ever since I saw a photo of "SteveBigGuns" anything with huge muscles or actual big guns I will instantly call "Steve". The first boss in my "Frantic" game also wears the name "Steve" because of the huge guns this enemy has. I wish I had the time to mention all my friends and respected creators, people whos opinions I value and care for. So I will just give everybody a big *hug*. Finally, is there anything you, as a creator, would like to add to this? Or any other experiences you’d like to share? If not, I’d like to ask one more question of you: If you could give any bit of advice to new creators out there who are thinking about entering the wonderful world of creating, what would it be? I'll keep this one short. Don't start a series until you are more experienced and are able to finish levels. Don't forget LBP is about fun, it's not about hearts, plays, MMpicks, Crowns, spotlights, popularity and other stuff. It's about having fun creating and playing with friends, and meeting new and interesting people. Be eager to learn and try to become a great creator and person. So, if you've never experienced one of Luos' levels before, what can you expect? This is a very difficult question to answer. You will receive a completely different experience with every possible level you dive in to! Each level on his earth is unique, in its setting, its scope, its gameplay and its feel. You're bound to choose a favourite among them, and perhaps you may think to yourself “Lu, dude, why don't you make another level like --Insert Your Absolute-Can't-be-Beaten Favourite Here--? That was awesome!”. The answer is simple – he's not just making them for you. He's making them for himself. Delving into a level by Luos is not finding out what awesome scenery or epic gameplay mechanic he's set up for you. Instead, it's like taking a trip into the darkest recesses of his imagination, finding out what his latest dream was, and taking a part of it back to your pod with you. Maybe this is a part of what makes his levels so popular, who knows? There's one thing I do know, though. I truly hope we'll get to see more! Well, that's all, folks! We hope you have enjoyed this installment of the Creator Spotlight. For past spotlights, please visit this link. See you next time! wow... It's been too long since we've had one of these, good to see them return. Yes indeedy!! At long long long long... well.. really long last, a new Creator Spotlight! YAY!!! I have to say a huge thanks and congrats to her as this was one amazingly well written interview. Wow.. I have to step up my game now! lol Congrats Ria and thanks so much!! One thing you will notice is the lack of a video. Sorry, but just too much time consumed to be able to keep up with those and do an interview of this caliber. However, we do have plans to release special videos here and there that will be announced and shown on the RemoteMoonProductions youtube channel. yay!! ..and there may be some other surprises along with those as well. So thanks for your patience or impatience, yelling, screaming, everyone wondering why!? Where did they go!! ...well, here they are again! Oh... and a special thanks and congrats to Luos for his time and thoughts. We thought he would be an excellent choice to do a spotlight on and he did not disappoint at all. Thanks Luos and Congrats!! Last edited by jwwphotos; 06-06-2012 at 08:27 PM. Gonna read it all now. Excellent read, glad it's back. On the old spotlights, I never knew any of the creators. But these days, I do. Guess that's with me joining the site now, I guess. Glad the reason I joined LBPC is back. Last edited by Valeview; 06-06-2012 at 08:41 PM. Follow me on Twitter @ValesView. Wow! I wouldn't have believed it, if I didn't see it with my own eyes. Awesome! Great work to everyone involved and a thank-you and congratulations to luos for being in this Creator Spotlight. May we have many, many more of these. Ah that's nice. Good to see this baby out in the open, at long last! Thanks ever so much for the opportunity to help feature even more awesome creators on this site! I can't wait to see who I get to talk to next! 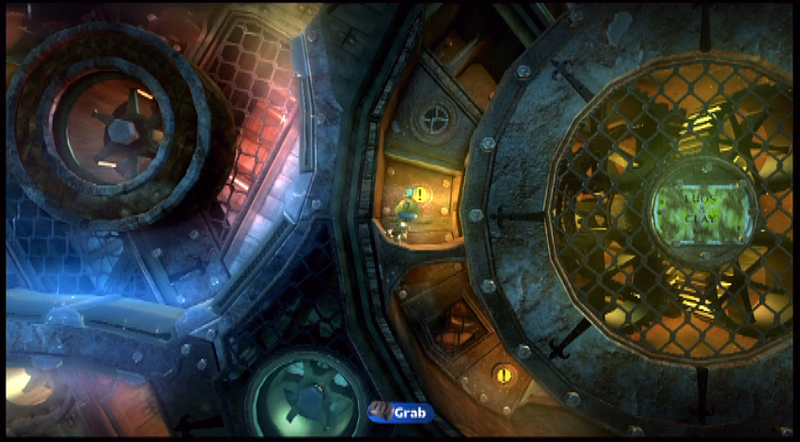 New Level: Purple Passageway for LBP2. Returned for PS3 and cookies. Did you read my post above? Nor even listened to the podcast where I explained all that? tsk tsk tsk..
Wow, that was unexpected. The last spotlight came out what, over a year ago? Great interview. I love reading these, they're a great way to get to know our "LBP celebs" a little better. You guys should definitely do more of these. Well deserved man hugs. From my few personal interactions i've had with Luos, I can say he seems to be a great stand up guy who is not beyond helping anyone be successful in LBP or life. My kids also adore him and his levels. PS - the format here worked and looked good on my iPhone. Its funny how I can find contradicions in the stuff I answered. I would like to thank Ria for her patience and this great honor to be interviewed by her. Gran'De Gos Bahm'Bhi! Gran'De Gos Bahm'Bhi! No Esca reh'Tahl!! We plan to... and have several already in the works. Looking forward to what's in the future for these amazing creators! "Staring at Craftworld and creating unfinished levels since 2008." Last edited by Lord-Dreamerz; 06-07-2012 at 04:50 AM. Excellent spotlight, Luos and Ria! It was totally worth being late for school in order to read it. My congratulations, Luos! I love your creations! Fanatastic to see the return of the Creator Spotlight! The interview was a great read, well done guys! Can't wait to see who's up next!